Akhtar Saeed Medical College Lahore (AMDC) is a private sector medical college. In 2008, the college was established in Bahria town. To be more precise, the large building of AMDC is 30 Km away from the zero point of Lahore. In addition to MBBS and BDS, the college also offers bachelors in the doctor of pharmacy (Pharm-D). Pakistan Medical and Dental Council (PM&DC) recognizes and approves the college after evaluation. Moreover, it is an affiliated institution of the University of Health Sciences (UHS). According to UHS, the entry test for all public and private medical colleges of Punjab is MDCAT. Click here know more about MDCAT (MCAT) UHS compiles the merit list of all medical colleges. The admission process for all the medical colleges, including AMDC, can be found out here. Furthermore, visit the colleges’ admission office on the given address: Farooq Hospital (West Wood Branch) Address: 262-263 West Wood Colony, Main Canal Road, (Opposite Metro), Thokar Niaz Baig, Lahore. Alternatively, you can also contact via email at [email protected] Moreover, their contact number is 0092-42-37498596, 37498293, and 37498557. Both the hospitals are an aid in the clinical teachings of the students at Akhtar Saeed Medical and Dental College. In 2012, Farooq Hospital west wood started working. It is a 220 bedded hospital. However, poor community members have 120 beds out of 220 dedicated for them. Farooq Hospital provides excellence in patient services. It has one of the best doctors. Moreover, it has state of the art machinery and the best infrastructure. Overall, it provides an ideal ambiance for the students to learn. Farooq Hospital meets all the required healthcare standards of the Punjab Health Commission. Consequently, it has been approved by Punjab Healthcare Commission. Moreover, Farooq Hospital holds the license of Punjab Healthcare Commission after a thorough evaluation. Akhter Saeed Trust Hospital is situated in EME society. The Hospital is a registered hospital since 1st July, 2000. The Hospital is a teaching hospital for Akhter Saeed Medical and Dental College. Moreover, the hospital is a non-profitable and charitable organization. The hospital provides primary and secondary health facilities to the poor people of the adjacent villages and residents of the society. Approximately, the hospital building covers about 15,000 sq feet area. Ultimately, it caters to 300 beds. There are state of the art lecture theatres for students of AMDC. As these lecture halls have multimedia, they facilitate teaching. Also, one lecture hall can aid 100 students each. Moreover, there are well-equipped labs for students. There is also a four-story auditorium with a capacity of more than 500 students at a time. It is located in the center of the academic building. It possesses the latest audio-visual aids. Therefore, it is used for conferences, debates, seminars or other activities. The college also has a canteen to provide fresh snacks to the students. There is a beautiful mosque located inside the campus. Here, students and staff members can pray in the serene view of the mosque. The college has signed a memorandum of understanding (MoU) with Bahria Town to provide sports facility to students. According to this, the students are permitted to utilize Bahria Town’s sports facilities. The campus has a computer lab with internet facility. For the most part, it is used to surf the web or access online resources. A well-resourced library is present on the campus. One can find the latest editions of all basic as well as clinical books in the library. General knowledge books, history books, Islamic and Indo-Pak history books are also present in the campus. Moreover, many national and international journals are available. Furthermore, the library has an excellent Internet backup. Additionally, CDs of different basic medical and clinical books are also available. The college provides the facility of accommodation for the students. There are separate hostels for boys and girls. Moreover, each hostel has its mess and canteen. Also, the hostels are adjacent to the college building. Generally, one hostel has 100 rooms. However, it contains both bi-seater and single-seater rooms. The College Academic Council (CAC) consists of the heads and professors of all academic departments. The principal is the head of the council. The council regulates the curricular and clinical activities of the students. Moreover, it also observes the regulations of PMDC and the university standards of education. Furthermore, it also compliances with the calendars of academics & examinations, and all the issues related to the education and training at. Students studying at Akhtar Saeed Medical and Dental College need many secondary resources, in addition to primary resources. Although the Internet and library help students a lot, nothing beats good video lectures. Students should try the highly recommended Dr. Najeeb Lectures. Compared to others, Dr. Najeeb simplifies the concepts. Usually, he teaches in lay man’s terms. Consequently, students find it easy to understand. Moreover, the website, drnajeeblectures.com, has all the topics of Punjab’s Medical colleges’ curriculum. A student can watch a lecture from Gross Anatomy, Neuro-anatomy, Embryology, Histology, Physiology, Biochemistry, Genetics, Pharmacology, Microbiology to Immunology and Pathology. You can check more details about the topics by visiting the video library. We all know that med school is tough but, with the right resources, it becomes relatively easy. However, we advise that you can try a lecture for free before getting a lifetime subscription. The fee structure is revised annually by PM&DC. It can also increase after each year, according to PMDC rules. However, as of the academic year 2013-2014, the total fee was PKR 811,290 for MBBS. It included tuition fee, admission fee, transport charges, university charges (5.5%), document verification charges, advance tax (5%), security money, medical fund, sports fund and security money. Note that admission charges are paid only once, i.e., in the first year. Want more insight? 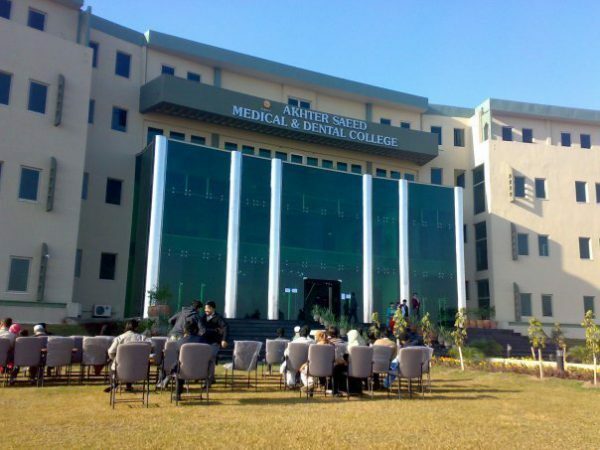 Click here for Akhtar Saeed Medical and Dental College’s Virtual Tour. In addition to that, you can also contact the college.